Bath is one of the most picturesque of British cities and this is reflected in David''s paintings. Full of narrow streets and a treasure trove of independent shops and tea shops there is a lot to see in the city. David Farren uses careful brushwork and colour to show not only the beauty of the honey-coloured limestone buildings but the energy and life of the people who go about their daily lives in the city. His aim is to capture the ambience of the busy streets he observes. 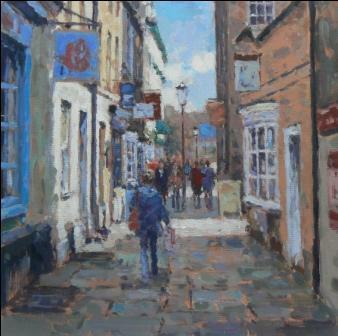 Colour and light are all important in David Farren''s paintings. He uses acrylic and oils, enjoying the immediacy and versatility of both mediums which he finds particularly well-suited to his direct, impressionistic and expressive style of painting. Artist David Farren is one of a growing number of artists whose modern art works feature at Red Rag Gallery in Bath. Modern art work from David Farren is regularly exhibited at the Bath art gallery which also offers an extensive choice of modern art, contemporary sculptures and collectible art prints from other present day artists.